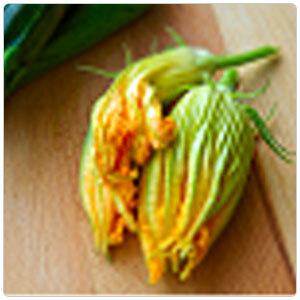 Ideally, squash blossoms should be used the day they are picked. They are commonly used as an appetizer after being stuffed with Ricotta or Fromage Blanc and herbs, battered and lightly fried. Other possible uses for squash blossoms include: tacos and quesadillas, pizzas, pastas, and risottos, frittatas and omelets, garnish for soups. When the squash plants begin to blossom, bees buzz around the garden searching for nectar. The bees' chances are extra good in the morning, when the squash blossoms open up. When bees visit a male flower, get down deep inside it, they pick up messy pollen. Then when they get to the female flowers, they transfer the pollen, leaving the male flower's pollen behind and pollinating the female flower. The male and female DNA combine to produce a fertilized egg which develops into a seed. Then, germination occurs, this is when the seed coat breaks open and the germ inside begins to grow, producing that fruit, aka zucchini. In hot weather, this takes only four to eight days!